Marisa Seiler of Wauseon drives into Andi Peterson of Archbold Friday in NWOAL girls basketball. Archbold held off a late rally from the Indians, winning by a final of 55-48. Wauseon’s Sam Aeschliman goes for a layup during Friday night’s game. She finished with 11 points for the Indians. 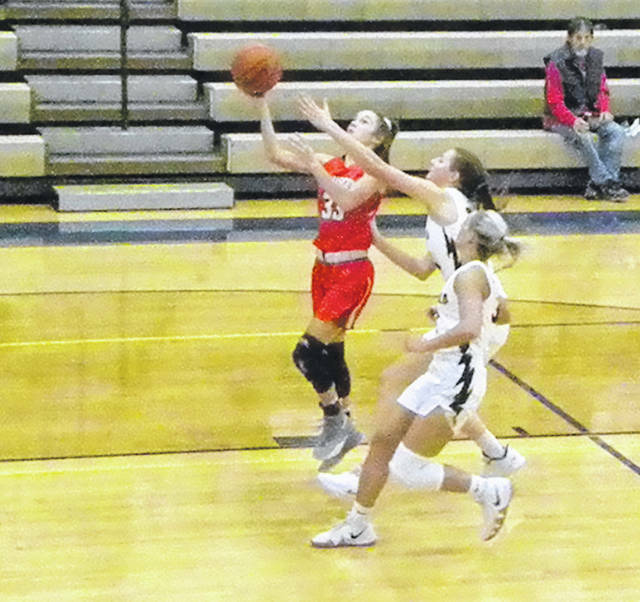 Entering the final period down by 20, the Wauseon girls basketball team made a run, but fell short as Archbold held off the Tribe 55-48 in Northwest Ohio Athletic League girls basketball action Friday at Archbold. The Streaks had a pair of two-minute scoring droughts in the final stanza, but did make enough shots from the charity stripe to seal the win. Trailing 46-26 with 7:26 to go, Wauseon put together a run. Sam Aeschliman started the spurt, and Marisa Seiler closed it with a trey and three free throws. 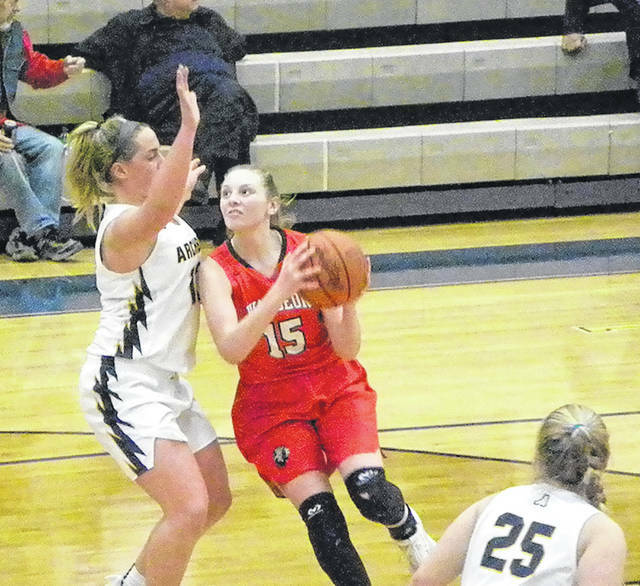 Andi Peterson got a bucket for the Streaks, but Wauseon went back to work. Sydney Zirkle scored, then off a third offensive rebound, was able to get to the free throw line and got one. The rebound by Zirkle was one of 18 offensive rebounds pulled down by the Tribe in the contest. Autumn Pelok added a pair of tosses from the line to cut the lead to single digits – 48-39 – with four minutes left. It shrunk to 48-44 after Seiler ripped off five points in succession. The Streaks were struggling without Lily Kreiger, who fouled out with five minutes to go. After missing a pair of one-and-one opportunities, the Streaks were finally able to convert at the line. Peterson and Addison Moyer combined to go 6 of 8 from the line in a one minute span, which pushed the lead back to 10. Peterson added two more free throws between the final two baskets of the game for Wauseon to make the final 55-48. After taking a 17-10 lead after one quarter, Archbold outscored Wauseon 16-2 in the second to lead 33-12 at the half. The Indians committed 20 turnovers in the first half. Archbold finished the game 20 of 45, shooting for 44 percent. Wauseon was 14 of 40 for 35 percent. However, Wauseon made 7 of 13 shots in the final period. The Indians also finished with a 40-18 advantage in rebounds. Peterson led all scorers with 23 points. Gabby Nafziger, who hit three treys in the first half, added 11 for Archbold. Seiler had 21 points for Wauseon and Aeschliman had 11. Archbold (8-4, 2-0) travels to Stryker Tuesday and Patrick Henry Thursday. Wauseon (4-10, 0-2) plays Thursday at Bryan.